Boxcutters, Jigger, Muddler, Citrus Juicer, Strainer, Highball Glass. 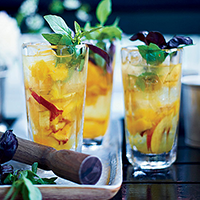 In a tall glass, muddle the peach with the 6 basil leaves and the lemon juice. Add the gin, Lillet and simple syrup. Add ice cubes and top with soda. Garnish with basil.